The IIG’s high-performance computing (HPC) system is integrated with the Intel(R) Xeon based 64-bit processors. This system uses Intel MPI over Infiniband interconnect. The system consists of 8 compute nodes, 1 head node, and two storage nodes. The system supports both OpenMP and MPI parallel environments for running the jobs in parallel. The system is connected to the storage with the usable space of ~ 40 TB. MATLAB:- MATLAB is a high-performance language for technical computing. It integrates computation, visualization, and programming in an easy-to-use environment where problems and solutions are expressed in familiar mathematical notation. IDL:- IDL (Interactive Data Language) is a programming language used for data analysis. IDL is vectorized, numerical, and interactive, and is commonly used for interactive processing of large amounts of data (including image processing). The codes written in the FORTRAN, MATLAB, and COMSOL that required large computing power can run on this system. The use of the parallel environment of this system in these codes can efficiently reduce the computational time for performing the simulation jobs. 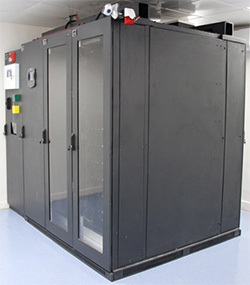 This HPC system can be used for modeling the Earth-Space system processes. System will be available for the external academic users depending on the availability of the processors time of this HPC system. External users will have to provide the job details, required CPU time and storage space at the time of the request application. Accessing and usage of IIG HPC Cluster is governed by IIG policies and procedures.